As red molten lava oozed out of Kilauea on the Island of Hawaii ("the Big Island") in May 2018, destroying houses and property in its path, clouds of ash particles and toxic gases from the volcano—known as vog—filled the air and drifted across the island with the wind. Even before this most recent phase of the Kilauea eruption, air quality was a major concern for citizens across the island. 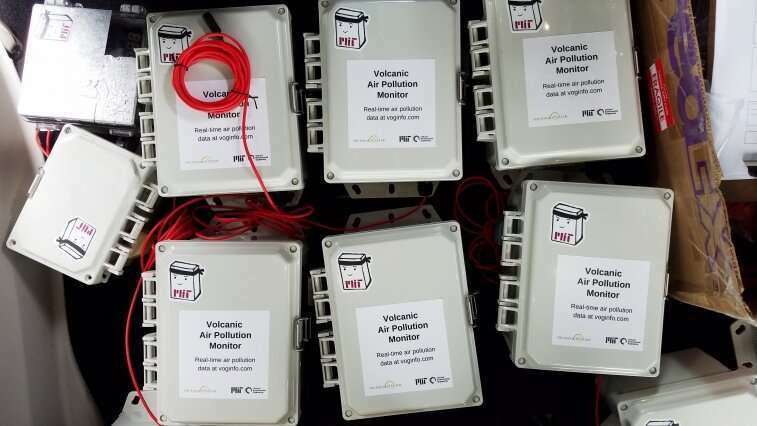 Researchers from MIT's Department of Civil and Environmental Engineering (CEE) have worked closely with citizens on Hawaii Island for several years to monitor air quality from the volcano using low-cost sensors. The researchers were even planning to launch a large-scale air quality project funded by the U.S. Environmental Protection Agency (EPA), but the emergency conditions created by Kilauea starting in the spring of last year, and the urgent demands for air pollution data from community groups and state government officials, prompted the MIT researchers to jump into action months before schedule. "We realized that because we'd been building these instruments for measuring gases and particles relatively quickly and inexpensively, we had the tools to help people in Hawaii understand the quality of the air they were breathing," says Jesse Kroll, associate professor of civil and environmental engineering and chemical engineering, who leads the air quality research projects across the island with Colette Heald, a CEE professor. "In a period of just about two weeks, we organized this effort in which we built a number of sensor boxes and came over here to Hawaii to try to put them up all over the island." "We had been working with MIT for almost two years on developing a project and it was, on our part, to help MIT place monitors and sensors so that they could construct and test a group of sensors that would provide air quality information both back to the university and be set up as a way to inform the public in general," says Betsy Cole, the director of strategic projects at The Kohala Center, a nonprofit organization that helped put the MIT researchers in contact with citizens, schools, and organizations across the island. Cole notes that an increase in the number of requests for information prompted her to contact Kroll to see if there was anything MIT could do to accelerate the process of providing sensors and measurements for citizens to understand the impact of the eruption—and its lasting impact—on their air. The MIT sensors can detect and measure sulfur dioxide, which is an irritant and can be toxic in large quantities, as well as particulate matter, including sulfuric acid. "With this eruption, there was some concern about ash coming from the volcano as well. So we can measure that with particulate sensors, too," Crawford says. The sensors provide real-time air quality data, and the information is published on a website created by the researchers. Currently, the website reflects data from 16 sensors across the Island, and more sensors will be added as the project progresses. There are many benefits to deploying the MIT sensors in place of larger, more expensive instruments typically used by government agencies. Hagan, the developer of the website and one of the original creators of this these sensors, explains, "[our sensors] have a much smaller footprint, so you can put them in more places; they are solar powered, so you can really put them in remote areas, and they communicate wirelessly over a 3G network, so we get all this data remotely in real-time at very high spatial and temporal resolution." The design of the sensors makes it feasible for the researchers to install them in many areas across the island, but this required buy-in from local citizens. "When deploying a sensor network like this, where you want to get measurements made throughout a region, it's really important to interact directly with members of the communities," Kroll explains. 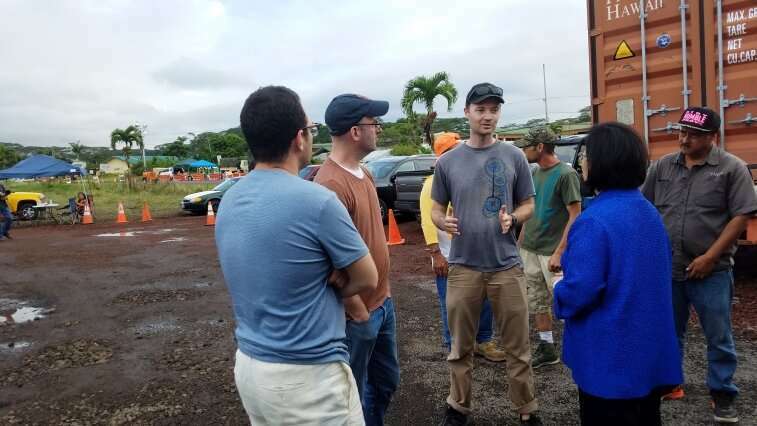 In turn, The Kohala Center established connections with schools and health centers in preparation for the EPA-funded research project, and the researchers were able to leverage these connections early as part of their emergency response project. The locations were strategically selected for their positions as community congregation spaces, and for the educational opportunities afforded by the sensor's data, as education and outreach are a central facet of the long-term research project. Crawford explains that, as part of the EPA project, "we're working with the teachers so they can use the sensors in different ways in their STEM curriculum, to engage with the students about data analysis, environmental science, [and] some programming skills," He moved to Hawaii in September to both maintain the network and to provide professional development opportunities for teachers. As Crawford and Hagan installed sensors at different locations shortly after the major eruption in May, teachers and administrators told the researchers about the impact of the eruption on their students, often reporting an increase in absences and in a few cases the loss of students' homes. Steve Hirakami, the principal and founder of the Hawaii Academy of Arts and Science (HAAS), estimated that almost 40 percent of their staff and students had been impacted by the evacuation. 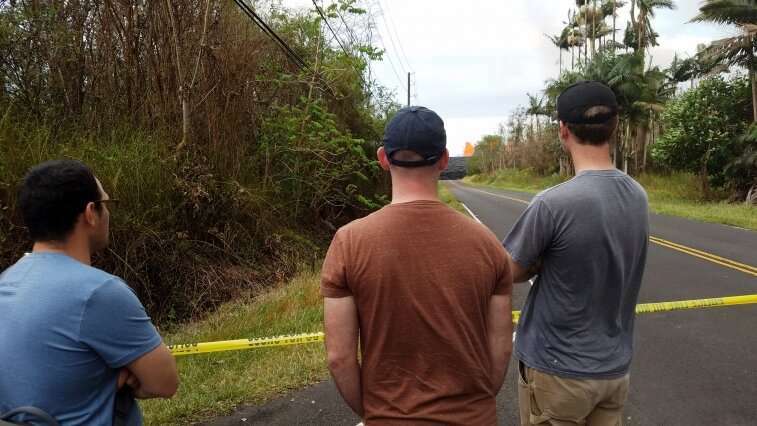 "This has a major impact on [our] school," he said in May when the Kilauea was still active. Hirakami used the MIT sensors to determine school closures and expressed gratitude to the researchers for providing him with the resource. In the immediate wake of the fissures, Wendy Baker, a history teacher at HAAS, worked with Crawford to install a sensor that the researchers had sent through the mail on the school's property, even before the researchers arrived on the island. She, too, highlighted the value of the sensors for the peace of mind for the community during the eruption, and also as a teaching tool. "The day that we came back, I pulled it up [on the projector], and we've been looking at it every morning, looking at the data and checking the air quality," she recalled. Baker also explained that the sensor was helpful for connecting the science behind the air quality with what students were experiencing in their everyday lives. Ted Brattstrom, a high school teacher at Ka'u High School, was similarly enthusiastic about having a sensor installed at his school. "The sensors are going to give us two benefits. The first and foremost benefit is, by having this data in one-minute intervals, we're going to know when we actually have an SO2 event occurring," he said. "That lets us keep the kids inside, and in as air conditioned an area and as filtered an area as we can, and then say when it's safe to go outside," he explained in May as the sensor at his school was initially installed. "As a science geek for myself and my class, we now get to see how the atmosphere is running, how not only the caldera itself—the volcano itself—is operating and putting out gases, but also how that's coming downwind, working with the topography of the Island, and getting the [vog] here." "The ultimate goal is for each school to have one of these air quality monitors, and by doing that the students get information on the air that they're breathing, really connecting these abstract concepts of chemistry and of measurements to something they actually know: the vog in the air they're breathing," Kroll says of the long-term project. "On top of that, it puts a data set in their hands. We make the data freely available so we can see all these numbers corresponding to concentrations of SO2 and particulate matter, and they can learn how to plot the data, how to analyze it, how to think about it in the larger context of environmental science." Since installing the sensors, the researchers have collected a unique dataset on the air quality across the island. They are currently analyzing their measurements from the eruption to better understand the atmospheric transport and transformation of vog components. The researchers are also hoping to learn how sensor data relates to—and complements—air quality measurements from other platforms such as monitoring stations and satellites. "Even though the eruption seems to be over, the network is still running. Right now, we're measuring very low levels of pollutants, as expected. This is good not only for the local air quality but also for the science: When researching pollution, it's not often you get to measure what the underlying background levels are," Kroll says of the ongoing research. 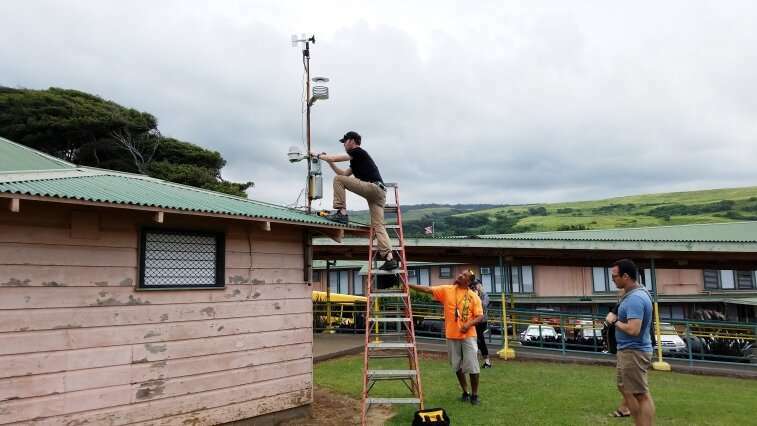 "More importantly, we now have the sensor network up, so we'll be ready to measure air quality across the whole island the next time Kilauea erupts." This is great stuff, and very welcome (says this poster who lives within 25 miles of the recent eruption). It's always been very difficult to get air quality data for the Big Island.